By adding the highly practical Triple Transducer Connect (TTC) module to your ultrasound system, up to three different transducers can be lined up, plugged in, and ready to scan. The TTC module is available in designs compatible with the Edge, M-Turbo, and S Series* systems. It can be attached to your system's SonoSite stand using the coordinating TTC Assembly Kit that contains all parts, tools, and instructions (except a #2 Phillips screwdriver) necessary for assembly. *While designed primarily for systems on SonoSite stands, the TTC module can be attached to a wall-mounted S Series system using a VESA (Video Electronics Standards Association) wall/arm mount with a weight-bearing capacity of at least 28 lbs/12.7 kg**. 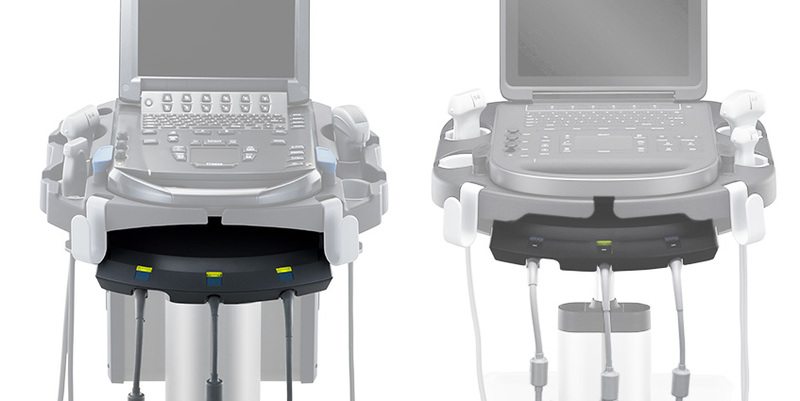 For safety purposes, it is the customer's responsibility to ensure that a VESA-compliant mount has been used, that the chosen wall mount meets all applicable safety standards and healthcare facility requirements, and that it can support the total weight of the S Series ultrasound system plus the TTC module, three transducers, and accessories. **Weight of 28 lbs/12.7 kg includes: S Series system with battery; large black mounting bracket; large plastic tray with cups; keyboard tray and mini-keyboard; gel bottle; and the following three transducers: C60, HFL38, and ICT.